Yesterday Tommaso discovered 12 on the rug at the bottom of the stairs. Her last few days were rough, she stopped eating, was visibly disorientated, and could no longer jump. That said, that was only the last few days, the previous 19 years (it may have been more given I found her as a stray in the Spring of 1998) she was not only healthy, but actively ornery. It was rough to see her lifeless body after so many years of vitality. Apart from my childhood family, she may have been the longest consistent daily presence in my life to date: she was my Brooklyn roommate (she didn’t believe in paying rent), came with us down to Virginia, and then took the trip to Italy at the ripe old age of 18. She found one of her many lives here in Trento until just last week. She was thriving so well I was beginning to believe she may very well make it past 20, but that would not be the case. I guess sooner or later we all have to retreat back into the great unknown—but until I do, I’ll miss 12. I dedicated a Daily Create to her back in 2013 if you are wondering why the hell she was named 12, and Tommaso created a slo-mo video of her just a couple of months ago which you can see above. She took up residence in the boys room the last year, and the loss hit the hard. And while we could tell she was slowing down, she still looked good. Why couldn’t age so well? Nothing gold can stay, not even the bava’s cat. This entry was posted in family and tagged 12, cat, goodbye. Bookmark the permalink. 19 is a good run for a cat. The cat of my childhood made it to the same age. It’s sad to see them go, but good to know they were above average. Thanks Paul, and that is some solace indeed. I don;t think I’ll make the above average category 🙂 Also, speaking 19 or 20 years, my book came yesterday, so we can start organizing the Twenty Days of Turin book club. 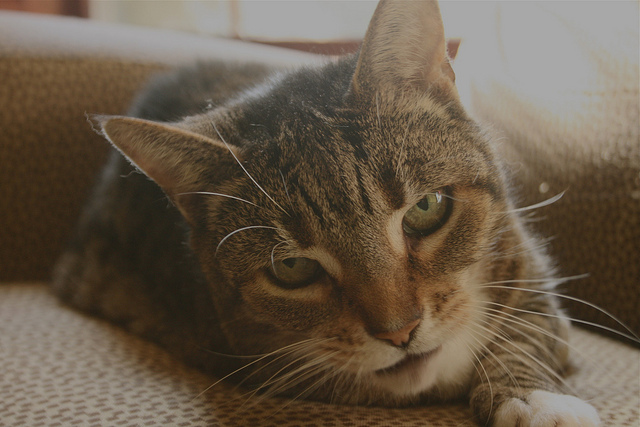 A cat named 12 living to 19, moving not only to Virginia of all places by ITALY, is heroic. All creatures, including dogs, can respect that. Take care of wiley Clyde. It was a sad story to read, UNCLE Jim. I am sorry to hear about 12. And it is also a sad coincidence about the bottom of the stairs. I would never do that to your cat.